Our family goes through crazy amounts of yogurt every week — potentially close to a full gallon of yogurt each week! 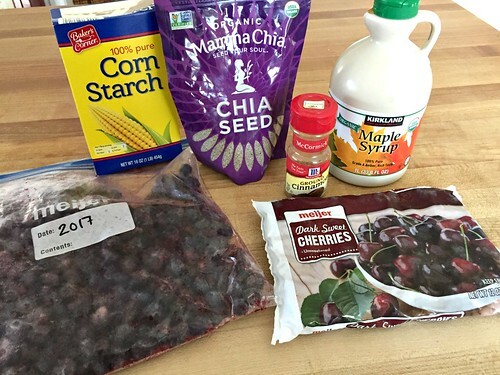 I make yogurt pouches for the kids as a filling and nutritious bedtime snack, we put yogurt in smoothies, I use plain yogurt in place of sour cream for almost everything, and Dave and I enjoy some type of yogurt at least once every day. 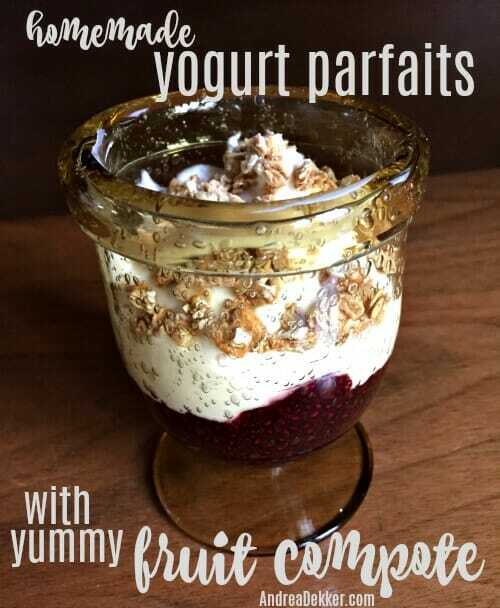 I first became obsessed with yogurt parfaits after I ordered one at McDonalds many years ago (probably when I was in college). I was instantly amazed at how much tastier the yogurt was when paired with fruit compote versus with fresh berries. And of course, a little sprinkle of crunchy granola on top adds to the deliciousness! My yogurt-eating habits have matured a long ways since my guilty college pleasure of McDonald $.99 yogurt parfaits… and since yogurt parfaits are a perfect spring-time snack, I thought it was high-time I shared my ridiculously simple recipe for my own homemade fruit compote that I use to make homemade yogurt parfaits. 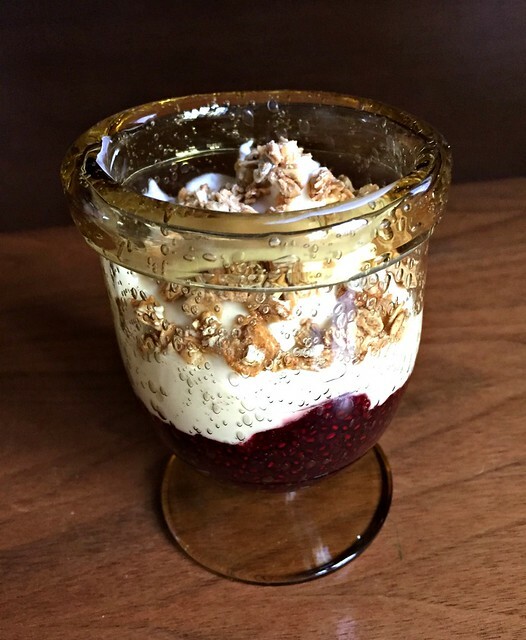 The parfaits are great for breakfast, brunch, an afternoon snack, dessert, baby showers, bridal showers, and so much more. 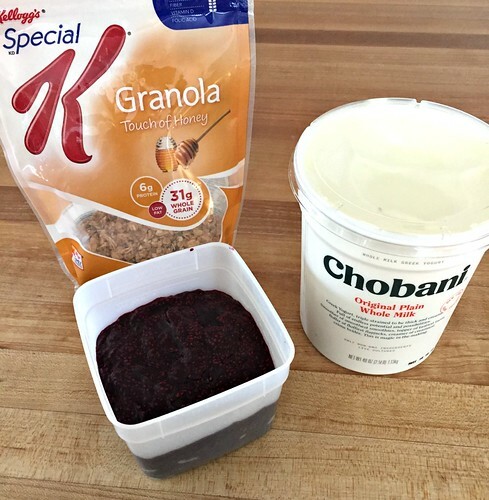 Just make sure you wait to add the granola until right before you eat them, so it doesn’t get all soggy! Oh, and I suppose I should mention, the fruit compote tastes fabulous poured over vanilla ice-cream, or even as a warm topping for waffles or pancakes! 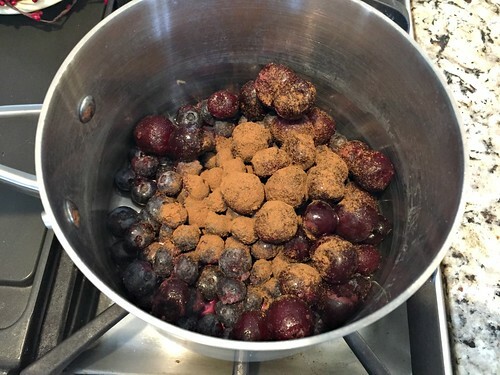 In a medium size saucepan, bring fruit, water, cinnamon, syrup and salt to a gentle boil over medium-high heat. 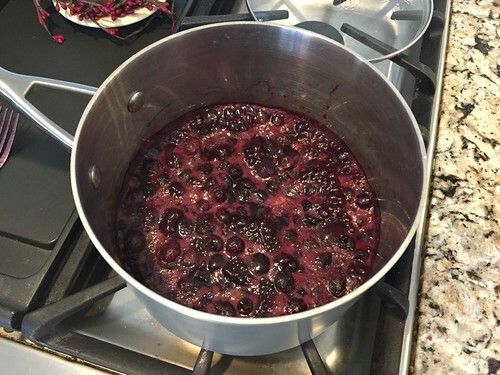 Turn heat down to medium-low and simmer until the fruit is very soft and some of the liquid has evaporated (I usually try to smash down my fruit with the back of a fork during the cooking process). 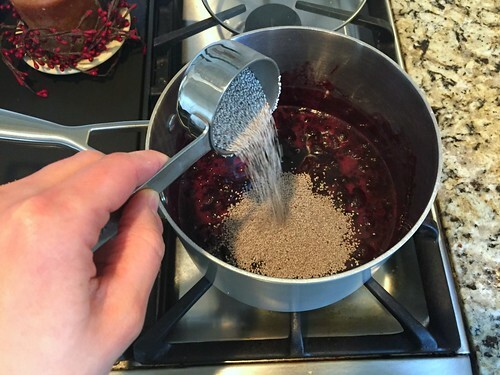 Once the fruit is very soft, remove from heat and add in cornstarch or chia seeds. 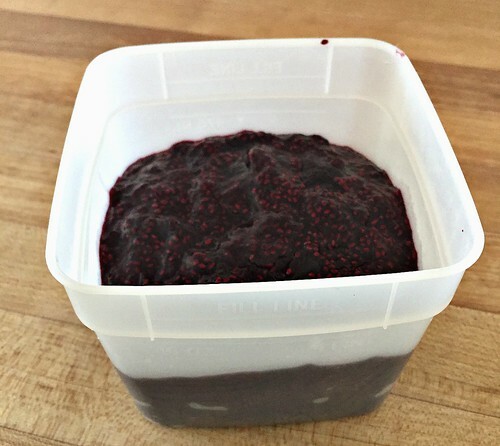 Store fruit compote in an airtight container in the refrigerator. It should last 10-14 days. 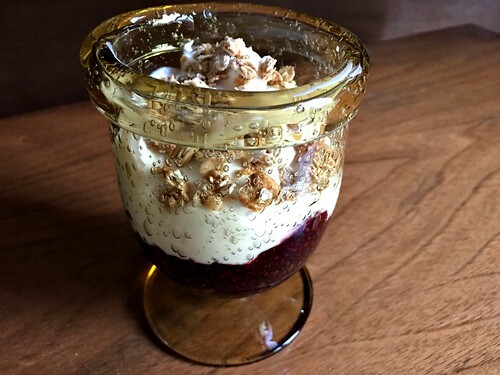 To make the parfait, layer 2 T. of fruit mixture, 1/3 c. yogurt, and a sprinkle of granola. 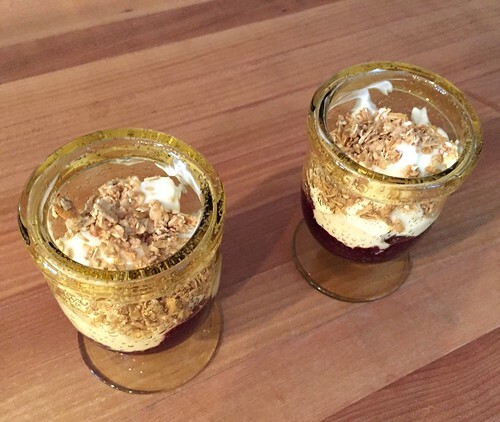 And let me assure you, these parfaits are much better than the McDonald’s parfaits! The cinnamon is such a great combo with the fruit (it smells delicious when it’s cooking) and the maple syrup adds just the right touch of sweet without being too overwhelming. I almost always have at least one container of different flavored fruit compote in the refrigerator at all times — and I can’t tell you how many times it has come in handy when people unexpectedly stop over. I can give them a “fancy” and nutritious snack with almost no effort! What fruit flavor combo would you want to try first? 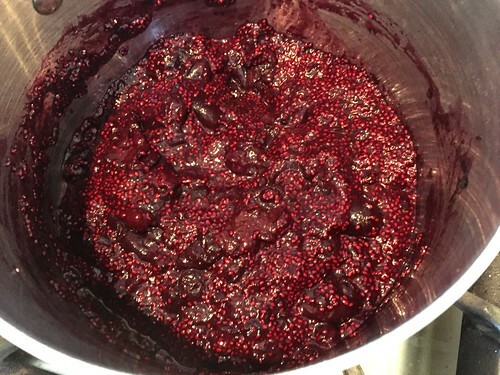 I made the fruit compote yesterday….very good. I really like adding chia to it. Next…the parfait. glad you liked it — the chia seeds are a good addition! I’m not much of yogurt fan but my hubs is. He usually gets the one that flavored and low sugar and I would rather do the healthier version of plain Greek yogurt. It’s probably why I don’t eat it that much because it’s so flavorless. However, I would o this parfait for sure! Your granola mix recipe is one I would totally do but I’d probably just buy my yogurt. I can’t wait to try this! thanks!! I used to make granola ALLLLLLLL the time, but got out of the habit! Anyway, you make it in a slow cooker and it requires almost no effort and it’s almost foolproof! Here it is if you’re interested. My husband is a granola snob. When he doesn’t make it himself, he has found that Walmart carries a very good granola, better than the national brands oddly enough, and it’s also cheaper. It can be hard to find because it’s often sold out. I guess others know about it. It’s Sweet Home Farm Honey Nut Granola. It’s not filled with puffed rice which he doesn’t like. The ingredient list is not full of a bunch of crazy ingredients. That compote looks delicious and it would be so convenient to be able to store it for a while. My mom used to make a rhubarb (or strawberry rhubarb) sauce, served with ice cream and/or angel food cake. yes, it keeps for a while in the fridge! We also make our own granola, a recipe we’ve had for years. We call it Grandma’s granola and it’s so good. Oh yum! Would you be willing to share Grandma’s recipe, Ann? This looks so yummy (and easy!). I LOVE dairy and we eat a lot of yogurt around here. Thank you for sharing! I can’t wait to give this a try. yes, I always joke that half my shopping cart is dairy whenever we’re grocery shopping! I certainly hope we never have to deal with a dairy allergy or intolerance! Yum! 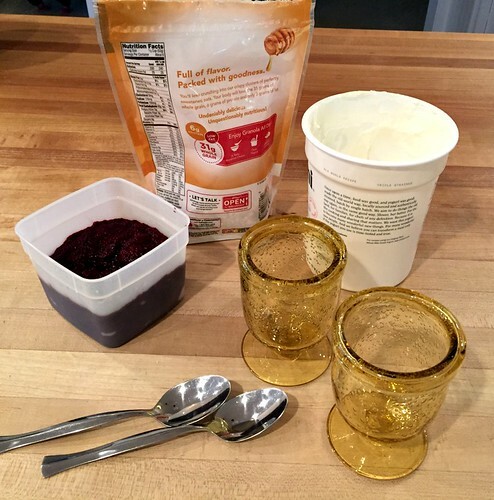 I have started to eat yogurt regularly with this pregnancy but have never made a compote! Going to try it this week!